Do you snore loudly, get a disturbed sleep and don’t feel as fresh in morning as you should feel? If this is the case, it is likely that you have sleep apnea. It’s not a disease and it can be cured with some remedies and natural treatments, which can help I reducing loud snoring. This post is all about sleep apnea, its causes and effects on health. There are sleep apnea treatments that help in curing this problem. Check it out. Are you one of them who take snoring as part and parcel of the sleeping habit? Do you become the reason of laugh among your friends and family for your loud sleeping issues? If you never took it seriously and always neglected it, it is likely to be sleep apnea disorder. This issue not just leads to loud snoring, but can make the snorer feel exhausted and tired after getting up from sleep as well. It can be a sign of many health issues too. Knowing the cause of sleep apnea and its effect, the natural treatment and others become imperative. There are different types of sleep apnea. It is basically a common sleep disorder wherein the snorer feels a lot of pauses of breathing during sleep, which occurs hundreds to thousand times during the night and leads to disturbed sleep throughout. This issue leads to the snorer not feeling fresh after getting up along with continuous feeling of being lethargic with lack of focus at work. While many consider it common, sleep apnea should never be taken lightly else it creates a serious issue on physical as well as mental health. Obstructive is the most common type of sleep apnea disorder found among the masses. Such a sleep apnea occurs when the throat muscles at the back relax during sleep and narrow the airway, causing the loud vibrating sound. The other two types of sleep apnea are central sleep apnea and complex sleep apnea. While the former is less common, the central nervous system comes into the picture. The loud snoring occurs, when the brain fails to give the signal to the breathing muscles. The latter is a blend of the two. If such symptoms are observed, ignoring such a sign, shouldn’t be the case. One should consult the doctor immediately for the causes of it and what sleep apnea solutions one should adhere in order to reduce the disorder. Losing weight in order to not let the extra fat settle near the throat causing the narrowness of the airway is the right way to deal with it. Reducing alcohol and smoking consumption before bedtime is needed. This will refrain from the neck tissues to relax causing the airway to shrink. Regular exercise also helps in losing weight. It also makes the person tired which triggers deep sleep and hence, reduction in snoring. Changing of sleeping position to side than on the back helps to avoid the throat muscle to relax causing the airway to narrow. This triggers loud snoring too. Tieing the tennis ball at the back of the snorer is the smart trick to force them to not sleep on the back even during deep sleep. This will help them to sleep sideways ensuring sound sleep for the snorer and the partner too. Using the right pillow: Elevating the head to some inches helps to keep the jaw, throat, and tongue at the right angle giving enough space for air to pass smoothly avoiding the vibrating sound to occur. Using oral appliances are also a good way to open the nasal passageway. Appliances like nasal dilators; nasal spray, nasal strips or Neti pot works wonders. Regular throat and tongue exercises also help to regulate the muscles to tighten the muscles. Trying chewing gum or keeping the pen between the teeth for sometime before bedtime strengthens the muscles. This leads to the reduction in vibration sound to occur. Continuous Positive Airflow Pressure (CPAP) is also a common treatment for sleep apnea. This machine forces pressure on the nose and mouth to keep the airway to be opened. If nothing works from the above methods, consulting doctor for surgery is the right way to work towards it. It can help in increasing the size of the airway to eliminate the vibrating sound to occur. 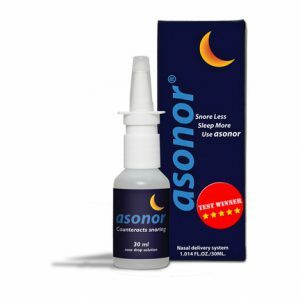 Asonor effectively eliminates the cause of snoring and it is an effective treatment, which relives you from the snoring. 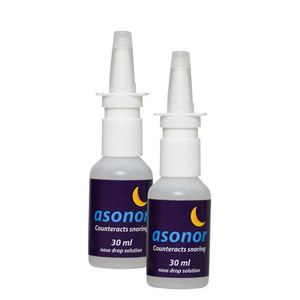 It is a medicated nasal spray which opens up a person’s airway with a regulated supply of medicine, thus strengthening the airway muscles and ensuring less relaxation of throat muscles with each use. Asonor © 2019. All Rights Reserved.